While visiting the Bahamas, do not miss your chance to have the ultimate dolphin swim experience. In our Blue Lagoon swim with the Dolphins package, you and your family will be able to interact with the beautiful Bahamas dolphins in the best way possible. Here, you will not only be able to touch and play with these majestic creatures, but you will also be able to swim through the waters with them. Hold on to their fins or have them carry you on their bottle nose. The excitement you will experience in with our Bahamas dolphin swim tours is unparalleled. The dolphin sanctuary on Blue Lagoon Island takes up a full three acres. Its features include the habitats for the pod of Bahamas dolphins, the areas for education and training, a kitchen, a lab for photo and video equipment, restrooms with changing facilities, and a gift shop. Your dolphin swim tour will begin with an education presentation where you will learn all about the dolphins, including information about their biological makeup, environment, and behavior. You will also learn the secrets of training these intelligent creatures. Soon after the dolphin presentation, you will be out in the water with them, putting the training techniques you learned into action. You will spin around with the dolphins, hug them, pet them, and even swim alongside them. You will be amazed at how gentle, friendly, and intelligent these Bahamas dolphins are! We have been running our Dolphin swim tours since 1989, enthralling visitors every single day of the year. 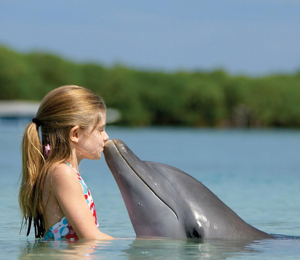 This is the highest level of interaction with dolphins you will receive. A full half hour of full engagement with the dolphins, employing the techniques used by the dolphin trainer to interact, play, and swim with these beautiful sea mammals. What is the difference between the "Dolphin Encounter" and "Dolphin Swim" programs? In the swim you are completely in the water with the dolphins, while in the encounter you interact with the dolphins from a waist-deep platform. How much do you spend with each dolphin? For the swim, you are in the water for 20-30 minutes with the dolphins. Is this tour handicap accessible? We will provide assistance for manual wheelchairs including providing wheelchair access into the water (with our waterproof chair) for the Dolphin Encounter program. For boating purposes, motorized powerchairs and non-collapsible wheelchairs are not allowed on our boats. Guests ages 6 through 12 must be accompanied by a responsible, paying adult with a ticket for the swim. Parent or guardian must be at least 18 years of age. Guests ages 13 through 17 must be accompanied by an adult (with any paid ticket) to sign the liability waiver. Guest must have the ability to swim to participate. Guests age 5 or younger are not allowed in swim program & may observe for free if attended on the dock by a responsible parent or guardian with an observer ticket. Guest must have the ability to go up and down ladders to access platform. For your safety, guests age 5 or younger are not allowed in the swim program, but can observe, & 3 or younger may observe for free if attended on the dock by a responsible parent or guardian with an observer ticket. We reserve the right, under certain circumstances, to omit specific behaviors or interactions from the program. Cameras are NOT permitted while doing any dolphin or sea lion program. Observers only are permitted to have a camera. I have been to the Bahamas many times, but Blue Lagoon Swim with the Dolphins is one of my favorite trips! It includes everything that everyone should do here. As a Bahamas veteran, I can say only the best about this experience!